Extended family refers to the family members who extend beyond the immediate or nuclear family of parents and their children. The term may be used synonymously with consanguineal family. An extended family may live together as a single household. Often there could be many generations living under the same roof, depending on the circumstances. Alternatively, in societies dominated by the conjugal or nuclear family, it is used to refer to kindred in addition to those immediate family members, and who live in different households. Generally, the extended family is contrasted with the nuclear family. 4 Is there an ideal family structure? Regardless of whether they live together in a single household or separately, the three- or four-generation extended family, including grandparents in addition to parents and children, provides a rich network for human relationships and great support for the raising of children and continuation of the lineage. In cases where there have been second (and more) marriages producing children, the extended family includes step-children and their kin. A conjugal or nuclear family consists of a father, mother, and their children. This kind of family is common where families are relatively mobile, as in modern industrialized societies. Usually there is a division of labor requiring the participation of both men and women. 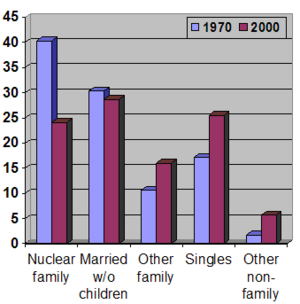 Nuclear families vary in the degree to which they are independent or maintain close ties to the kindreds of the parents and to other families in general. A consanguineal family consists of a husband and wife, their children, and other members of either the husband's and/or wife's family. This kind of family is common in cultures where property is inherited. In patriarchal societies where important property is owned by men, extended families commonly consist of a husband and wife, their children, the husband's parents, and other members of the husband's family. In societies where fathers are absent and mothers do not have the resources to rear their children on their own, the consanguineal family may consist of a mother and her children, and members of the mother's family. In a joint family, parents and their children's families often live under a single roof. This type of family often includes multiple generations in the family. Complex family is a generic term for any family structure involving more than two adults. The term can refer to a joint family, consanguineal family, or to a polygamy of any type. It is often used to refer to the group marriage form of polygamy. In cultures where the nuclear family is the norm for establishing a household, members of the extended family live in separate homes, often at significant distances. In societies where the consanguineal or joint family predominates for living arrangements, members of the extended family will live in the same home. In the cultures where the extended family is the basic family unit, growing up to adulthood does not necessarily mean severing bonds between oneself and one's parents or even grandparents. When the child grows up, he or she moves into the larger world of adulthood, yet does not, under normal circumstances, establish an identity separate from that of the community. The network of relatives (including biological, adopted, and foster) that forms the extended family acts as a close-knit community. In the joint family setup the workload is shared among the members, often unequally. The women are often housewives and cook for the entire family. The patriarch of the family (usually the oldest male member) lays down the rules and arbitrates disputes. Other senior members of the household will baby-sit infants when their mother is working. They are also responsible for teaching the younger children their mother tongue, manners, and etiquette. The members of the household also look after each other and take over their responsibilities in situations where a member is ill or otherwise disabled. Charles Sprague Pearce, Family (1896). Library of Congress Thomas Jefferson Building, Washington, D.C. 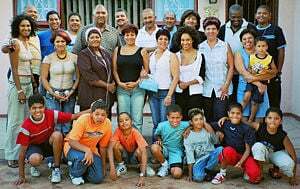 In many cultures, such as in those of many Africans, Koreans, Middle Easterners, Jewish families of central Europe, Latin Americans, Indians, East Asians, and Pacific Islanders, extended families are the basic family unit. Even in the United States, the extended family has a significant role. In traditional Asian families, in China and Korea for instance, the extended family shares a household consisting of the nuclear family of the head of the household, his unmarried daughters, and his sons and their families. When daughters marry they join their husband's family. It is common for the senior members of the extended to choose an appropriate spouse for children when they reach the age of marriage. In such arranged marriages, the qualities sought for in a spouse include social status, ability to work, wealth, and so forth. Australian Aborigines are a group for whom the concept of family extends well beyond the nuclear model. Aboriginal immediate families include aunts, uncles, and a number of other relatives who would be considered "distant relations" in context of the nuclear family. Aboriginal families also have strict social rules regarding whom they can marry. The Balkan zadruga (Cyrillic: задруга) is a type of rural community historically common among South Slavs. Generally formed of one extended family consisting of married brothers and their families, members of a zadruga lived in a single household and functioned as an agricultural and economic unit. The zadruga held its property, herds, and money in common, with the oldest capable patriarch usually ruling and making decisions for the family. Because the zadruga was based on a patrilocal system, when a girl married, she left her parents' zadruga and joined that of her husband. Within the zadruga, all of the family members worked to ensure that the needs of every other member were met. The zadruga in this form eventually went into decline beginning in the late nineteenth century, as the largest started to become unmanageable and broke into smaller zadrugas or formed villages. After World War II and increasing industrialization, the zadruga lost its economic significance. However, rather than disappearing, the zadruga transformed itself from the horizontal extension of brothers to a vertical extension between generations. Thus, a significant proportion of the people (around 70 percent), continue to live in extended family households. The zadruga continues to color life in the Balkans; the typically intense concern for family found among South Slavs today is partly due to centuries of living in the zadruga system. Many modern-day villages in the Balkans have their roots in a zadruga, a large number of them carrying the name of the one that founded them. In India, the family is a patriarchal society, with the sons' families often staying in the same house. A joint Hindu family, otherwise called as "Hindu Undivided Family" (HUF), is an extended family arrangement prevalent among Hindus of the Indian subcontinent, consisting of many generations living under the same roof. All the male members are blood relatives. The household consists of persons lineally descended from a common ancestor, and includes their wives and unmarried daughters. A daughter ceases to be a member of her father’s family on marriage and becomes a member of her husband’s family. An undivided family, which is the normal condition of a Hindu society, is ordinarily joint. The joint family status being the result of birth; possession of the joint cord that knits the members of the family together is not property but the relationship. The family is headed by a patriarch, usually the oldest male, who makes decisions on economic and social matters on behalf of the entire family. The patriarch's wife generally exerts control over the kitchen, child rearing, and minor religious practices. All money goes to the common pool and all property is held jointly. Businesses carried out by Hindu joint families in India are governed by the Hindu Law, where the liability of the entire business is borne out by the oldest surviving male member, who is the head of family and is also the head of the business by default. The lack of joint liability often leads to disputes and splits and is one of the prime causes for the breakup of the joint family system in India. Although industrialization and the proliferation of ideas of individualism have led to the increase of nuclear families as the unit of many societies, the extended family continues to play an important role. The extended family becomes valuable in contemporary society when young adults face unemployment or divorce, or when older adults become widowed or face declining health and consequent lack of ability to care for themselves and their house. Social welfare provisions made the extended family less essential for the elderly in the twentieth century. However, reductions in government funding for such services may make the role of the extended family take on greater importance again in the twenty-first century. Low income urban groups, including single-parent households, benefit greatly from the involvement of grandparents. Extended family networks have also been found of assistance in the assimilation of immigrants. In fact, by the end of the twentieth century the proportion of extended family households in the United States has been found to be on the increase. Is there an ideal family structure? Comparison of family arrangements in the United States in 1970 and 2000. People in the Western world in recent history have tended to idealize the two-parent nuclear family. The man typically is responsible for income and support, the woman for home and family matters. However, in the latter part of the twentieth century, family arrangements in the United States have become more diverse, with no particular household arrangement representing the majority of the U.S. population. Some have expressed concern over a purported decay of the family and see this as a sign of the crumbling of contemporary society. Yet anthropologists have pointed out that these are merely variations on family types that have existed in other societies. In virtually every society in which historians or anthropologists have inquired, one finds people living together on the basis of kinship ties and having responsibility for raising children. The kinship ties invariably imply restrictions on who has sexual access to whom; the child-care responsibilities invariably imply both economic and non-economic obligations. And in virtually every society, the family is defined by marriage; that is, by a publicly announced contract that makes legitimate the sexual union of a man and a woman. In other words, while single-parent families form a recognizable type, they are not the first choice where there is the possibility of forming stable two-parent families. However, where men are not strongly bound to the family unit, where a culture does not support lasting marriage, or where economic hardships cause men to be apart from their wives for long periods of time, this family type becomes prevalent. In many cultures, the need to be self-supporting is hard to meet, and the foundation of a new household can be an obstacle to nuclear family formation. People remain single and live with their parents for a long period of time. Generally, the trend to shift from extended to nuclear family structures has been supported by increasing mobility and modernization. Still, some argue that the extended family, or at least the three-generational family including grandparents, provides a broader and deeper foundation for raising children as well as support for the new parents. In particular, the role of grandparents has been recognized as an important aspect of the family dynamic. Having experienced the challenges of creating a family themselves, they offer wisdom and encouragement to the young parents and become a reassuring presence in the lives of their grandchildren. Abraham Maslow described the love of grandparents as "the purest love for the being of the other." The emotional pull of these intergenerational encounters remains strong even for those who have split off to form nuclear families. Individuals who leave their extended families for the economic benefits of life in a distant city may feel a sense of isolation and a longing for the relationships and warm love of the extended family of their origin. This suggests that, economic issues aside, people are happiest living in extended families, or in nuclear families that treasure close bonds with their kinfolk, their extended family. A strong family provides a haven of love and intimacy. In developing one's ability to relate to others it is important to experience love from caring adults. Although the formation of a secure attachment to the primary caregiver, often the mother, is paramount, expanding the range of experiences with a variety of trustworthy adults develops one's ability to love. 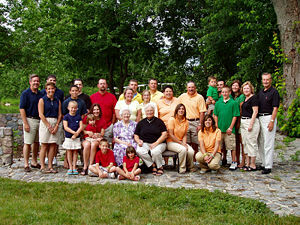 The extended family provides a number of adults with whom such relationships are possible. It offers maximum opportunities for personal growth through its matrix of relationships—with spouse, parents, grandparents, siblings, and children. In such an extended family one is also challenged to relate to a diversity of people. Close contact with those of different personality types provides valuable training in relating harmoniously with a variety of people. It helps ingrain the lesson that although people differ, they are fundamentally related and may still treat one another with respect, appreciation, and love based on their common bonds. A strong family provides a social support network that its members are able to rely on in times of stress. The extended family provides a superior alternative to the nuclear family in many cultures, expanding the family dynamic inter-generationally. Grandparents offer a unique form of support to the family, both to the parents and to the children. When a newly married couple moves far away from their parents, establishing their own nuclear family, isolation from their extended family may prove stressful. Families in which three generations interact in close harmony provide greater support for successfully raising children, connecting them to their family traditions and giving value to their lineage. ↑ J. M. Halpern and D. Anderson, "The zadruga: a century of change," Anthropologia 12 (1970):83-97. ↑ 2.0 2.1 J. E. Glick, "Nativity, duration of residence and the life course pattern of extended family living in the USA," Population Research and Policy Review 19 (2000):179-1998. ↑ 4.0 4.1 Brian Williams, Stacey C. Sawyer, and Carl M. Wahlstrom, Marriage, Families, and Intimate Relationships (Boston: Pearson, 2005, ISBN 0205366740). ↑ Institute for American Values, Why Marriage Matters: Twenty-six Conclusions from the Social Sciences, 2nd ed. (New York, NY: Institute for American Values, 2005). ↑ James Q. Wilson, The Moral Sense (New York: Free Press, 1993). ↑ Abraham Maslow, Motivation and Personality, 3rd ed. (New York, NY: HarperCollins, 1987, ISBN 978-0060419875). ↑ International Educational Foundation, Educating for True Love (New York, NY: International Educational Foundation, 2006, ISBN 1891858070). Institute for American Values. Why Marriage Matters: Twenty-six Conclusions from the Social Sciences, 2nd ed. New York, NY: Institute for American Values, 2005.
International Educational Foundation. Educating for True Love. New York, NY: International Educational Foundation, 2006. Extended Families - Study Of The Extended Family Marriage and Family Encyclopedia. This page was last modified on 8 August 2017, at 16:01.